A sweet and spicy goat cheese. Incredible harmony arises when sweet honey meets thyme in this flavored goat cheese made of 100% pure, Dutch goat milk! 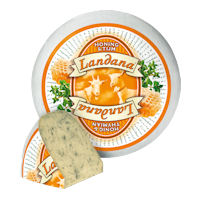 Landana Goat cheese HONEY & THYME is a delicious mild goat cheese with a sweet and herby taste palette.